Introduction : Pulmonary vascular disease is a risk factor in the surgical management of patients with d-transposition of great arteries (d-TGA) and a ventricular septal defect (VSD). In older infants or children with this physiology, the question of operability often arises. Cardiac catheterization in this condition can be fallacious. It is well known that oxygen reduces pulmonary arterial pressure and pulmonary vascular resistance especially where irreversible pulmonary vascular obstructive disease has still not set in. We tried to implement this effect of oxygen in correlation with echocardiography in patients with TGA-VSD physiology where operability was in question. Methods : Patients with d-TGA and a large post tricuspid shunt in whom operability was considered doubtful were selected for the study. We administered humidified oxygen at the rate of 10 litres/minute by mask for 48 hours in the ward or intensive care unit. After administration of oxygen we reassessed the child echocardiographically looking for signs of lowering of pulmonary vascular resistance which included increased pulmonary venous blood flow to the left atrium (LA) and right to left shunting across the VSD. Observation : We studied 1 patient with d-TGA and aortopulmonary window (APW), 4 patients with TGA / large VSD and 1 patient with Taussig-Bing anomaly. The age of the studied children ranged from 4 months to 3 years with a mean age of 1.1 years. After administering oxygen as described, echocardiogram showed an increase in pulmonary venous blood flow to the LA and right to left shunting across the VSD in 5 patients and increased flow reversal in aorta in presence of the APW. Conclusion : Patients with TGA/VSD physiology with doubtful operability can be subjected to this method of determining operability using echocardiography after administering oxygen. Although not 100% accurate in predicting long term postoperative pulmonary hypertension, this is a simple, noninvasive method that can aid in decision making in such a situation. Accelerated pulmonary vascular disease is prevalent in complete transposition of great arteries (d-TGA), especially in the presence of a nonrestrictive ventricular septal defect (VSD) ,,,, or large patent ductus arteriosus (PDA). Grade 3 or 4 Heath-Edwards histological changes are found in about 20% of infants before 2 months of life and in approximately 80% of patients after 1 year of age. , Pulmonary vascular disease is a risk factor for the surgical management of patients with d-TGA and a VSD or any other large post-tricuspid shunt. Surgical repair, therefore, is performed in early infancy, before irreversible changes occur in the pulmonary vasculature. In older infants or children who present with this condition, the question of operability often arises. Controversy exists as to the usefulness of cardiac catheterization in this particular situation. Cardiac catheterization to determine operability in patients with d-TGA-VSD physiology and severe pulmonary artery hypertension has certain fallacies such as pulmonary artery saturation being higher than that of the aorta due to parallel circulation, and difficulty in entering the pulmonary artery for pressure measurements. Additionally, cardiac catheterization, being an invasive procedure, has certain risks and complications in these cyanotic, ill, and pulmonary hypertensive patients. There are no clear guidelines, therefore, as to who should be catheterized. In order to assess operability without a cardiac catheterization in this situation, we developed a simple screening test, using inhaled oxygen and postoxygen echocardiography findings, to help make this decision. We selected patients with d-TGA with a large post-tricuspid shunt, e.g., VSD, PDA, aortopulmonary window (APW), who had presented to the hospital late and were clinically judged to be worrisome for operability based on the following findings: (a) oxygen saturation below 80-85%; (b) a quiet precordium and no clinical signs of increased flow; (c) chest X-ray without plethora or cardiomegaly; (d) an echocardiogram showing a predominantly left to right shunt across the VSD suggesting that pulmonary vascular resistance (PVR) was higher than systemic vascular resistance (SVR) and absence of left heart dilation in addition to the reduced pulmonary venous return. 2- D echo showing presence of dilatation of left atrium (LA) and left ventricle (LV). We present herewith a summary of the result of these cases fulfilling the eligibility criteria in a tabular form in whom we applied our clinical method of determining operability [Table 1]. In this clinical series, a total of six patients were administered oxygen to assess operability, with an age range of 4 months to 3 years (mean age: 1.1 years). Out of six patients studied, five patients appeared operable based on changes in the echocardiography findings after oxygen administration. Four of those operable (i.e., four of five) patients underwent arterial switch operation and one patient underwent atrial switch surgery. The immediate surgical outcome was found satisfactory in all cases postoperatively, except in Case 2 who showed evidence of persistent moderate pulmonary arterial hypertension. Although Case 4 still appeared inoperable on echo even after giving oxygen, the surgical team elected to proceed with an arterial switch operation due to his young age of 6 months. This patient demonstrated persistent PAH and severe RV dysfunction postoperatively. Thus overall in five of six patients (83%), the postoxygen echo accurately predicted the outcome in patients with TGA-VSD physiology in whom operability was questionable. Patients with TGA and a large post-tricuspid shunt are at risk for early onset and rapid development of severe pulmonary vascular obstructive disease (PVOD), which complicates the course of the patient. In fact, PVOD is a major determinant of both immediate and late surgical mortality after correction of the defect. The quantitative assessment of PVR by hemodynamic and saturation data obtained by cardiac catheterization does not always represent the true status of the patient. Unsure extent of mixing of two parallel circulations, especially in the presence of suspected pulmonary vascular disease in TGA-VSD physiology, always raises a doubt on pulmonary flow and PVR calculated by catheterization data. In addition, pulmonary arterial oxygen content is usually very high; the arteriovenous oxygen difference is therefore low, so that small variations in the measurement of oxygen saturations will result in major errors in the calculation of flow. The application of the Fick principle tends to overestimate the pulmonary blood flow and hence underestimate PVR. Furthermore, bronchial artery hypertrophy has been shown angiographically  and histologically  suggestive of increased bronchial flow in TGA patients. If there is a large bronchial flow, the true oxygen saturation of precapillary blood would be considerably lower than that measured in pulmonary arteries. Therefore, the true pulmonary arterial oxygen saturation of blood perfusing the lungs would be lower and the flow calculated from the measured oxygen saturation would be higher than the actual flow. , This error due to the effect of the bronchial circulation giving spuriously high estimates of pulmonary blood flow has been found to be greatest when oxygen consumption is low and aortic blood is very desaturated. In addition, in some cases, due to anatomical factors, the catheter is unable to enter the pulmonary arteries and then pulmonary flow and PVR cannot be obtained due to incomplete data. Additionally, catheterization itself is an invasive procedure and not free of side effects and complications especially in cyanotic patients. The fallacies of catheterization in such patients made us think about using oxygen administration followed by echo assessment to solve the issue of operability in older patients with TGA and a large post-tricuspid shunt. It is well known that oxygen reduces pulmonary arterial pressure and PVR , especially where irreversible PVOD has still not set in. This effect of oxygen is typically tested in the catheterization lab. Clinically, we attempted to analyze this effect of oxygen noninvasively in correlation with color Doppler echocardiography in patients with TGA-VSD physiology where operability was in question. After giving oxygen, PVR fell in all our cases, except in Case 4, [Table 1] resulting in increased pulmonary blood flow as indicated by increased pulmonary venous return to LA. Additionally in Case 1, there was reversal of flow in the descending aorta in the absence of aortic regurgitation suggesting an increase in the left-to-right shunting of blood through the AP window which was not there prior to oxygen administration. 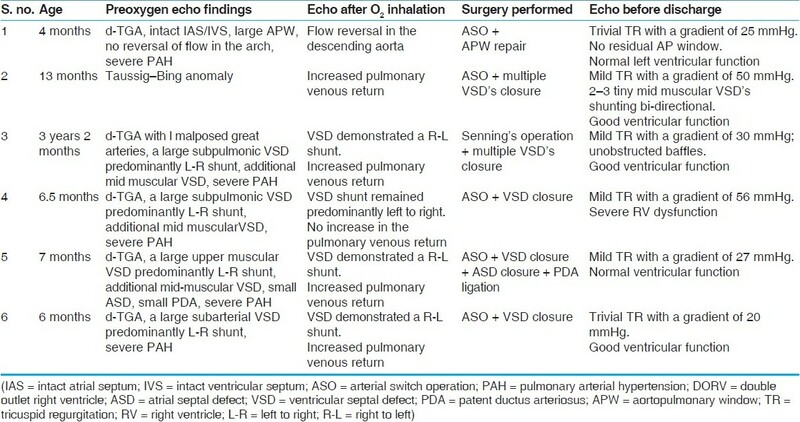 In Cases 2, 3, 5, and 6, the shunt across VSD changed in the direction to right-to-left after oxygen administration, again suggestive of a drop in PVR. An overall analysis shows that in five out of six study cases (i.e., 83%), postoxygen echo predicted operability accurately in patients with TGA-VSD physiology in whom operability assessment was not straightforward. Although number of patients we studied were few, , we found this method practically useful in determining the operability in TGA-VSD physiology. Description of any such method in this particular situation is not available in the literature. Patients with TGA-VSD physiology who present late to the hospital, and in whom operability is doubtful on clinical assessment, can be subjected to the above-described method of determining operability using echocardiography after administering oxygen. Although not 100% accurate in predicting operability and postoperative pulmonary hypertension, this is a simple and noninvasive method that can aid in decision making in a tricky situation. A large prospective study to assess the utility of this clinical tip needs to be performed. 1. Newfeld EA, Paul MM, Muster AJ, Idriss FS. Pulmonary vascular disease in complete transposition of the great arteries: A study of 200 patients. Am J Cardiol 1974;34:75-82. 2. Tynan M. Transposition of great arteries: Changes in circulation after birth. Circulation 1972;46:809-15. 3. Wagenvoort CA, Nauta J, van der Schaar PJ, Weeda HW, Wagenvoort N. The pulmonary vasculature in complete transposition of great vessels as judged from lung biopsies. Circulation 1968;38:746-54. 4. Yamaki S, Tezuka F. Quantitative analysis of pulmonary vascular disease in complete transposition of the great arteries. Circulation 1976;54:805-9. 5. Clarkson PM, Neutze JM, Wardill JC, Barratt-Boyes BG. The pulmonary vascular bed in complete transposition of the great arteries. Circulation 1976;53:539-43. 6. Waldman JD, Paul MH, Newfeld EA, Muster AJ, Iddriss FS. Transposition of great arteries with intact ventricular septum and patent ductus arteriosus. Am J Cardiol 1977;39:232-8. 7. Haworth SG, Radley-Smith R, Yacoub M. Lung biopsy findings in transposition of the great arteries with ventricular septal defect: Potentially reversible pulmonary vascular disease is not always synonymous with operability. J Am Coll Cardiol 1987;9:327-33. 8. Dibardino DJ, Allison AE, Vaughn WK, McKenzie ED, Fraser CD Jr. Current expectations for newborns undergoing the arterial switch operation. Ann Surg. 2004;239:588-98. 9. Heath D, Edwards JE. The pathology of hypertensive pulmonary vascular disease. A description of six grades of structural changes in the pulmonary artery with special reference to congenital cardiac septal defects. Circulation 1958;18:533-47. 10. Wagenvoort CA, Nauta J, van der Schaar PJ, Weeda HW, Wagenvoort N. Effect of flow and pressure on pulmonary vessels. Circulation 1967;35:1028-37. 11. Adams PJ, Lucas RV, Ferguson DK, Lillehei CW. Significance of pulmonary vascular pathology in ventricular septal defect as determined by lung biopsy (abstract). Am J Dis Child 1957;94:476. 12. Wernovsky G. Transposition of the Great Arteries. In: Hugh D. Allen, David J. Driscoll, Robert E. Shaddy, Timothy F. Feltes, editors. Moss and Adams' A. Heart disease in infants, children and adolescents including the fetus and young adult. 7 th ed,.Philadelphia: Lippincott Williams & Wilkins; 2008: 1049-53. 13. Visscher MB, Johnson JA. The Fick principle: Analysis of potential errors in its conventional application. J Appl Physiol 1953;5:635-8. 14. Ferencz P. Transposition of great vessels. Circulation 1966;33:232-41. 15. Rudolph AM. Congenital diseases of the heart: Clinical-physiological considerations. 2 nd ed. New York: Blackwell pub; 2001. page 66. 16. Bush A, Busst CM, Knight WB, Carvalho JS, Rigby ML, Shinebourne EA. Preoperative measurement of pulmonary vascular resistance in complete transposition of the great arteries. Br Heart J 1990;63:300-3. 17. Vitiello R, McCrindle BW, Nykanen D, Freedom RM, Benson LN. Complications associated with pediatric cardiac catheterization. J Am Coll Cardiol 1998;32:1433-40. 18. Morrison G, Macartney F. Effects of oxygen administration, bicarbonate infusions, and brief hyperventilation on patients with pulmonary vascular obstructive disease. Br Heart J 1979;41: 584-93. 19. Ohashi N, Matsushima M, Maeda M, Yamaki S. Advantages of oxygen inhalation therapy for postoperative pulmonary hypertension. Pediatr Cardiol 2005;26:90-2.